The first and most important question you may be asking is: Can I have coffee on Whole30? Good news – yes, you can have coffee on Whole30 (thank goodness because let’s face it – many of us wouldn’t be able to function without the help of our brew buddy). If you like your coffee black anyway, you’re good to go! Even for those who prefer their coffee with some tasteful addition, there are actually some ingredients you can add to your black coffee to improve the taste. Nutpods (officially Whole30-approved coconut and almond creamer, available on Amazon or Thrive Market). Some folks may be put off by the concept of coffee without cream and sugar. We’ve got 5 tips to help those new to clean coffee get their feet wet. 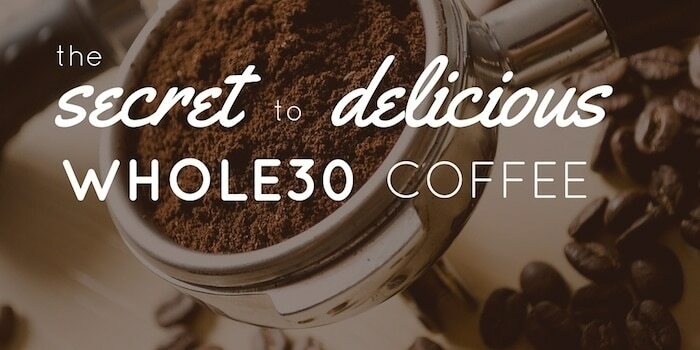 Here are a few tips and tricks for better tasting Whole30 coffee. You may not realize it if you’re used to adjusting the flavor of coffee with cream or other additives, but coffee itself can taste very different depending on the brand and bean used. Cheaper coffee brands like Folgers will taste completely different than higher-end coffee. Try picking up coffee from local roasters or purchasing higher quality coffee beans from grocery stores or Starbucks. Even if you think you can’t stand black coffee, a higher quality coffee could make a huge difference and not taste as bad as you think! Many coffee enthusiasts testify to the fact that whole bean coffee (which is grinded before brewing) tastes much better than pre-ground coffee. 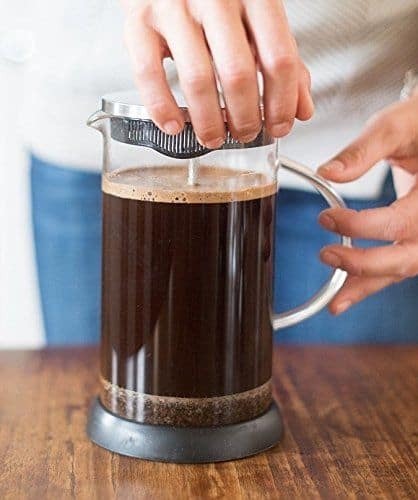 Grab a grinder (I recommend the KRUPS coffee grinder that I use) and start grinding up your coffee beans at home before brewing a pot in the morning – you may find that the taste is more to your liking with freshly ground coffee! Coconut milk is a compliant ingredient that can be added to coffee. It’s not quite the same as regular dairy milk, but it still changes the taste of coffee that regular dairy users mind find enjoyable. Heck, you may even find that you prefer coconut milk over dairy, with its light, nutty taste! It’s recommended that you stick with full fat coconut milk, since light coconut milk is really just watered down normal coconut milk (although light is fine if you prefer it). Also make sure to purchase only Whole30 compliant coconut milk from a can, rather than a carton. Coconut milk from the carton is usually very processed and contains not-so-healthy additives. As always, double check your coconut milk ingredient list to make sure it’s the real deal with no chemical additives. Coconut cream is also worth trying out (it’s really just ultra-thick coconut milk – perfect for adding to coffee)! Almond milk is another option, so long as it’s compliant (unfortunately, complaint almond milk is hard to come by, so you may want to try making it yourself). Drip coffee is the preferred coffee brewing method of most Americans, but many coffee connoisseurs will tell you it’s not the best technique. The paper filters used for most coffee makers absorbs some of the oils from the coffee beans (and it’s those oils which help give the coffee its flavor, so removing those oils can change how the coffee tastes). Instead of drip coffee using paper filters, you may want to consider trying out a french press! A french press is popular tool for brewing coffee since is quick, easy, and does not require any paper filters (making it slightly more eco-friendly as well), resulting in a richer taste. You could also try opting for a reusable mesh coffee filter instead of paper filters. The mesh filters don’t absorb oils, plus you’ll save money not needing to constantly buy more paper coffee filters. Just add the spice to your pre-ground coffee and you’ll find your java tasting just marvelous! These recipes mostly re-articulate what we’ve already suggested above, but if you’re a recipe collector, here are a few pro Whole30 coffee recipes to keep at your disposal. Basically, any combination of coffee, coconut milk, coconut oil, and cinnamon will be sure to create something tasty. Experiment and see what you like best! This Whole30 latte recipe comes from The Whole Smiths. Instructions: Add ingredients to a tall cup. Use immersion blender (aka hand blender) to blend ingredients until frothy. Enjoy! You may have already heard about the popular Bulletproof Coffee, said to help boost brain power. Well, The Kitcheneer has come up with a similar, Whole30 compliant brew. Instructions: Add ingredients to a blender, blend on high. Then enjoy! Do you have any insider advice for brewing up better Whole30 coffee? Share your top tips in the comments! Are extracts allowed? I love caramel extract in my coffee. You have to check and see if the extract is alcohol based. If not, you’re good to go! My coffee hack is cold brewed coffee. Drip coffee is too acidic for my stomach without some cream, but cold brewed is smooth. I can drink it black and it doesn’t bother my stomach at all. I agree – good iced coffee (especially nitro) goes down smooth as butter!